Key elements of design often go unseen by the untrained eye. In a passive house (an ultra-low energy building), for example, the way different cooking exhaust fans operate to remove harmful particulates and carcinogens from the air and their associated energy consequences may seem altogether invisible. But the new Institute for Health in the Built Environment (IHBE), within the College of Design, wants to make these and other subtle experiential designs more visible. In Spring 2018, architecture graduate students tackled this kind of research in collaboration with Portland area design firms: Hacker, SRG Partnership, Scott Edwards Architecture, ZGF, Ankrom Moisan, and Green Hammer for a class called, “Design the Unseen: Research Investigating Health + Energy in Building Design." That collaborative work resulted in student papers and presentations on a range of issues from the effect of daylight on microbes in open offices to lifecycle assessments of mass timber buildings and Passivhaus design strategies. 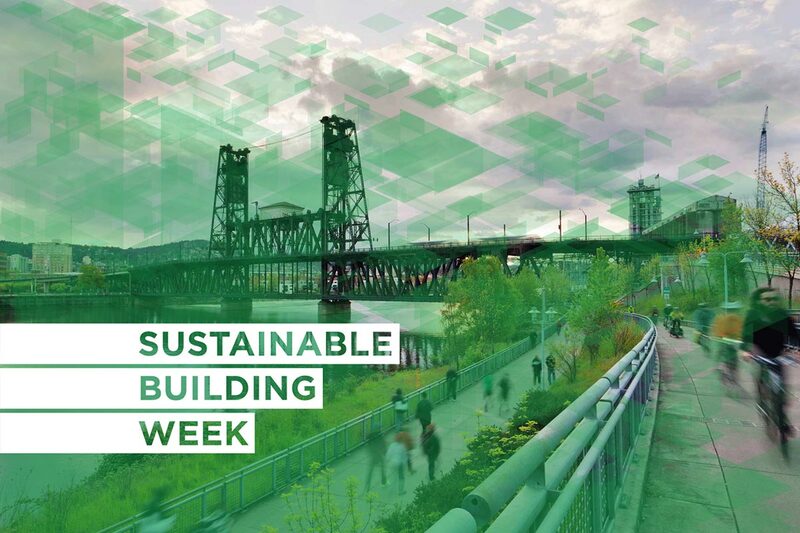 Their findings and more student research will be on display at Portland’s inaugural Sustainable Building Week, October 8-14. Events run the gamut from presentations and panels to an innovation bazaar and a tour of passive houses. An IHBE event, “Design the Unseen: Educating Designers to Consider the Micro and Macro for Sustainability,” runs from 5:30 to 7:30 p.m. on Wednesday, October 10, at the White Stag Block, 70 NW Couch St.
“This event will showcase our students’ recent work to advance sustainability in Portland,” said Mark Fretz, associate director of Outreach and assistant research professor in the Energy Studies in Buildings Lab, who was the instructor for “Design the Unseen” course. “The students are a big part of the sustainability ecosystem in town,” Fretz added. The highly collaborative event will highlight the role of academia in Portland in advancing sustainability and will also feature presentations by Elizabeth Lockwood of the Art Institute of Portland (Interior Design faculty, LEED AP ID+C, IIDA Professional, IDEC), and Travis Bell of Portland State University (associate professor in Sustainable Design in the School of Architecture). Fretz says that events like these, as well as pairing students with professional firms and scientists, facilitates one of IBHE’s goals—to ask bigger, better research questions. 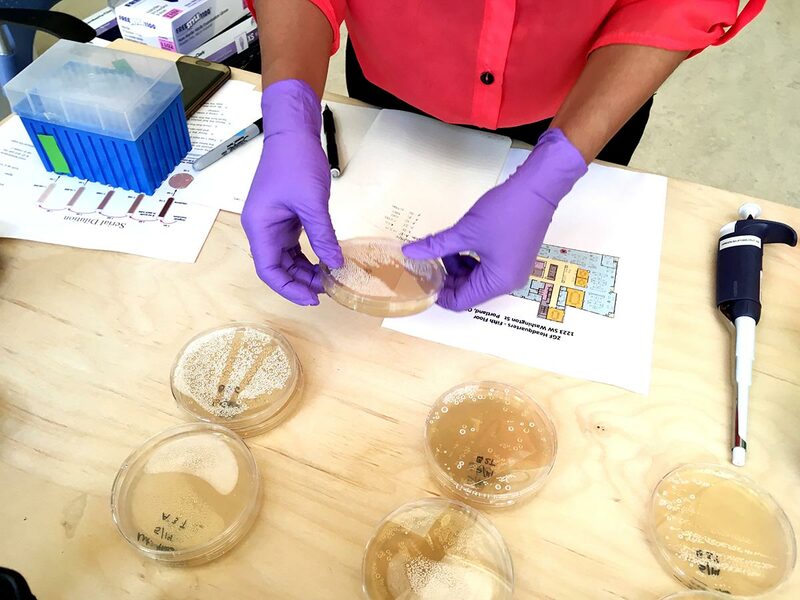 Design the Unseen students investigated the effect of daylight levels on microbes in an open office environment.